Hi Andy, you’ve come to the right place. Many dudes share this problem, and I have just the solution for you. Place plates or mats where the barbell would normally touch when hip thrusting, and simply roll the bar up onto the plates/mats as shown in the video below. This is how my lifting partner Charles Staley does them, and it makes a world of difference for males with big butts and thighs. Two days I ago, I posted the video below which shows mats being used in the same fashion. Either way works. What about putting down weight versus not putting un floor between reps? So far I lift weight only once during set. Eduards, that is fine. I explained that in the “how to hip thrust” post a few days ago. Okay to reverse in mid air or touch down on each rep. Either way works. Thanks for the video, Bret. 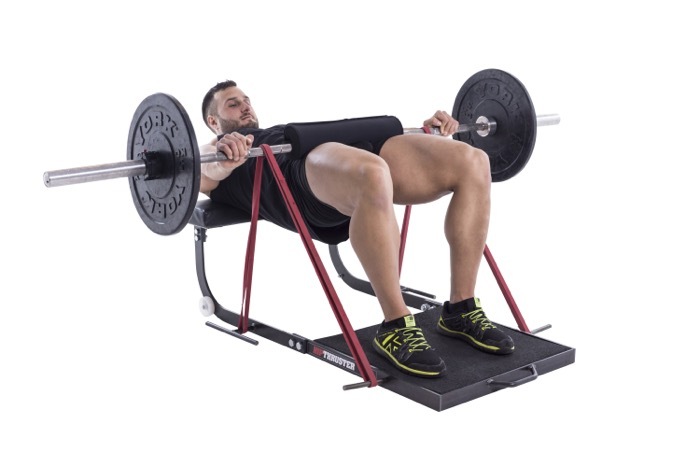 It seems to me that using the bench that way could cause the lifter to use it as a lever, thus limiting the activation of the hip extensors. The guy in the second video looked as though he was doing this. Would you agree? Thanks. Not sure what you’re referring to Aaron. If you shift your back and slide rearward it definitely becomes easier, and sometimes this naturally tends to happen especially as the loads get heavier. But I think the guy in the second vid is exhibiting excellent form especially given that he was performing 1-3 RM’s. I get what you’re saying….so you need to make sure you keep your back in position throughout the movement. I’ll have to give this a go myself. Thanks again. The back doesn’t shift itself. There is no muscle operating up the back that can “walk up a bench”. The back can only slide backwards in response to force that is being transferred through the floor. I believe that sliding backwards in the top lockout position of a HT is due to quad force actively extending the knee. The back is no longer “wedged” into place, and there is insufficient friction from the body to hold it still against the closed chain quad extension force. In contrast if you are “pawing” at the ground as Rob P. calls it, then you are pulling with the hamstring, which may even pull your torso forwards on the bench. So if you don’t want to slide backwards, you have two choices: Either turn the volume on your quad down as the hip extends. Or try to “pull the ground towards you” at the top. Or, perhaps even better, experiment with a way to anchor the back in more securely. In theory, if you had perfect balance between the two movement synergist quad and hammies, you might be able to do a HT on roller skates, as the force would be exerted straight down into the ground. Hey bret, I noticed that you never blog about reverse hyperextension and pendulum quadruped hip extension, why is that. Plus do you recommend them for anyone as progression exercises to work that glute muscle along with hip thrust? Hey Bret, I was just wondering when you’re releasing your 2×4 max strength program? I’m looking forward to picking this up. Thanks. Bret, would you say that by not touching the floor on each rep that it is more likely to increase hypertrophy in the lower glutes as opposed to coming to the floor on each rep?